We are all saddened by the loss of a dear man and great friend today in Mac Spikes. Mac passed away early this morning at home with his loving family after a hard battle with cancer. He was a perfect example of what a father should be. If I can be half the father to my children as he was to his, I will feel like I accomplished something in my life. Mac loved this class and these boards and the SCCA crowd in general. While Mac liked racing, he loved the people. Whenever he was at event, you knew you would have a good time. He was th kindg of Nicknames.. I think he has giving all of one along the way. I think I have about 5 now. Somehow, he had a way of just brightening the entire weekend. His Texas Drawl will live in my mind for the rest of my life. I will sure miss that guy, I miss him already. When arrangements are made, I will pass along. I am very sorry to hear this news. I never met him, but always enjoyed his insight into life and our class. He will be missed. Very sorry to hear this, thoughts go out to his family. I met big Mac at the very first SM ARRC with DDG, Karl and the rest of the original SM gang, and always loved catching up with him at various enduros over the years. Mac always had time to drop what he was doing in the paddock and had time to chat with you. His presence will be greatly missed. Very sad indeed. Although I never met him, I could tell he was exactly as Jim described him. He brightened up these posts with his wit and was always charitable to others causes. We have lost a good one, but we are better off for having had him in our life. So sad to hear. We never met, but Mac did bring lightness to the site & I'm sure to everyones life. 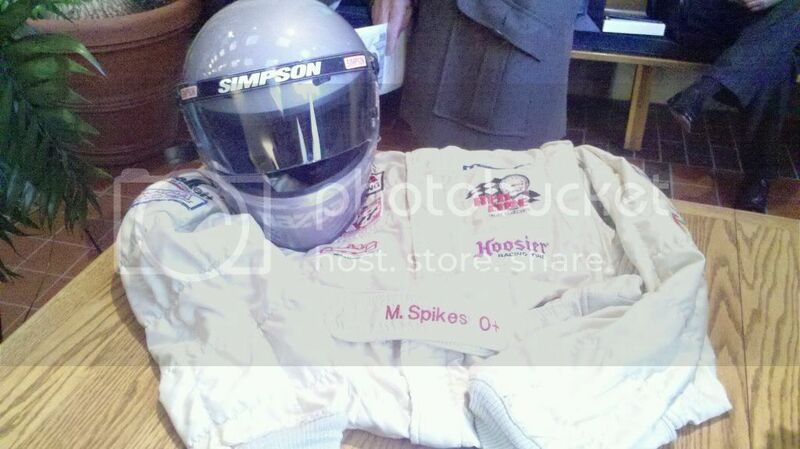 As Jim stated above Mac Spikes was one of the good guys. Always with a smile or a quip about something. I got to watch a race or two with Mac at the RunOffs this year, and enjoyed every minute of it. Although I only knew him for a few years, there is true sorrow in my heart and there will be a void in our world without Mac. We've lost one of the great ones today. I am just glad that I had the good fortune to call him my friend. RIP Mac. I was glad to meet and race with him on his trip up to Road America several years back. RIP Mac, you were one of the good guys and will be missed. Along with Shawn Dewey, I also had the great pleasure and honor to have met Mac and the original Southwest SM gang at the first SM ARRC invitational. The SM paddock at Road Atlanta was divided into two separate camps; the northeast and the southwest, Mac was quick to bridge the gap with is humor and diplomatic ease, although the Texan beer that he brought along certainly helped warm our cautious New Englanders attitude towards “them” Texans. Mac was everyone’s friend, always with a big smile and an enthusiastic greeting whenever we would run into each other during the following years. I’ll especially miss his well written and sometimes sarcastic post on this board. Great story Serge. I never had the pleasure in person but he and I have talked many times on the phone. A loss for every group he was involved in. I've got too many stories about ole Mac that bring back too many good memories. It was my pleasure to know him and call him my friend. Maybe our Aggies will beat LSU in the Cotton Bowl for ole Mac. I sure hope so. I am sad. My prayers are with his family. I still remember buying my first spec miata from him. Car was red and gold before I later painted it blue. He will be missed, he was such a funny guy and fun to hang around. Wow. I'm sad that Mac is gone, but it's good to know that he was surrounded by his SM brothers during his final days. He will be missed. Sorely missed. Although like many I knew this was coming, getting the text this morning caused me to pause for a few minutes. Mac was a nice guy that enjoyed life. I appreciated that and I will miss him. RIP Mac. Thoughts and prayers with his family. Yes, thoughts and prayers to his family. I can't think of a greater ambassador than Mac for racing, golf, or even life itself. This one hurts. I am glad he was a part of our lives. I have many wonderful memories and I will miss him. It's way too easy to get so complacent and assume your friends are going to live forever. Mac Spikes was such a strong person with such a larger-than-life personality that it was even easier to imagine him always being a part of our lives. Even after the diagnosis and during his fight you just had this feeling that Mac was going to win. Mac looked me in the eye earlier this year and told me he was going to lose - but I stubbornly hoped and thought he was wrong. Well, he was right and he's gone... but I learned today at his memorial service that he had such an impact on his friends and especially family that his memory will live beyond forever. Over the past six months, I was involved in a project to help build Mac's dream car. 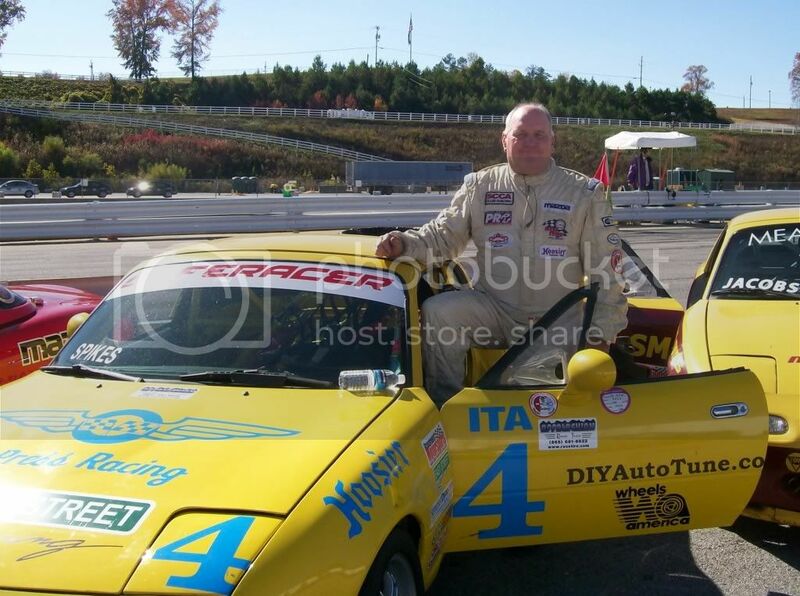 He'd raced Mazda Miatas and long as I'd known him, and he was as passionate about them as he was about his whole life. Here was a man who lived his dreams, in every way possible - yet he yearned for an even more impactful racing experience. He knew it would be the last race car he built, and the urgency of that fact often came through in his frustration of it not being done as soon as he'd hoped. He had heard of and seen a Miata race car that someone had squeezed a Corvette engine into, and he wanted to have one like that to have a last summer of fun. That wretched complacency that tricks us into imagining our friends being immortal, combined with a busy summer and the complexity of the project, meant that the project fell short and Mac never got to drive his dream car. Today got me thinking... that car is a bit of a mirror of Mac's life. It was small, but it was very powerful. It was extremely fun but very complex. It was very recognizable but under the skin completely unique. And sadly, and most poignantly I think - it wasn't finished in time. I feel like Mac was taken away from his family and friends before he was finished, as his dream car was taken away from him before it was finished. The car was sold a month or so ago, and shipped away. I hope the new owner knows how special that car is and takes great care of it. Mac was many things... A husband, a father. A PGA golf professional and a passionate auto racer and enthusiast. But the thing that sticks out the most to me is that he was kind. He was that rare combination of tough and sweet. He knew when to love and when to love tough - and he loved so many people. I've been very fortunate in the last few years in reaching my dream as a professional racer. Along the way, at every milestone in my career I've received the heartiest congratulations and praise from Mac. He always stopped by, called or started an online thread somewhere to root for my accomplishments. Whenever he wrote about me, it was as if he was genuinely proud of me... proud to know me. Today, I am proud of Mac for the life that he lived and the joy that he brought to his family and friends... and I am proud to have known him. Godspeed Mac - I know that in heaven, there are no tire walls! -2008 SPEED TC Rookie of the Year! Just back from Macs services. While it was sad, it was a celebration of a great mans life. Mac spoke to the reverend before his passing. In typically Mac fashion, Mac was able to reference "Talladega Nights' and just like Ricky Bobby, he preferred to pray to the baby Jesus. they had a video going of pictures throughout Macs life. Had we seen some of those pictures before his passing, we could have had even more fun with him. We will all miss him dearly! Dr. Dan now owns the car, and he absolutely knows how special the car is and what it meant to Mac. It is in very good hands, indeed. My condolences to all those who counted Mac as a friend. I corresponded with him as we built similar cars in parallel, and he seemed like a genuinely great guy. @Jason - that was very nicely written. 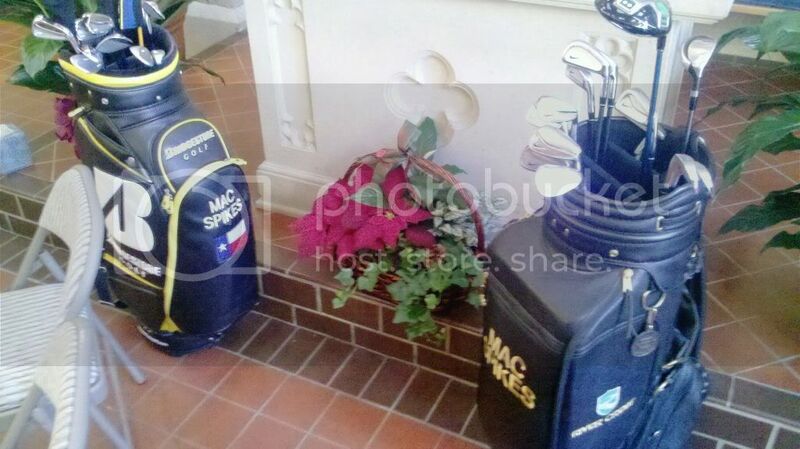 Seeing those pics of Mac's golf bags remind me that Mac was just as loved in the Golf Biz as in Racing . In the early days of SM , I remember seeing Mac's name in a race result ... I thought , could that be the same Mac I know from the golf biz ? ... So I gave him a ring and proceeded to talk me into building an SM. It's no surprise that SM became so popular with guys like Mac promoting the cars. Thanks Jason and Jim, wonderful words remembering a wonderful man. He will be missed. I have very fond memories of Mac, I ran into him many times over the years. He loved to do the endurance races and came to Summit Point for the 12 hour many times. One year at the 12 hour he was racing in another class but near the end the SSM battle was very close. After 11.5 hours the two lead cars were on the same lap separated by less than 20 seconds. We were in the lead and watching our progress very closely. As we approached cars in other classes we would go to there pit stall and solicit help. Basically we asked for a quick point by and that maybe they would get a little racy with our competition. We got to Mac's team and he was in the car. They handed me the radio and I tried to relay to Mac what we were trying to do and could he help. He kept yelling back "MIke (yes capital I if you listend to Mac say my name you knew the I was a capital letter) I don't understand". Then his lovely daughter grabbed the radio from me and yelled into the mic "Daddy block the yeller car". Mac simply replied Ok and he raced that car very hard for several laps. Mac helped us win the race and for that we are very thankful and will remember him always. We tell the story often. Godspeed Mac, may you rest in peace. Man that is funny! I can hear him saying MIIIIKE as I type. Mac was truly the definition of a "class act"
I didn't get to meet Mac at the ARRC a couple years ago, but every time I saw the Texas license plate on his race car that said "AH D OS" I had to chuckle a little. And I never did get to see the front of that race car while on track. Just wanted to pass this along for those that might be able to further leverage their gift.